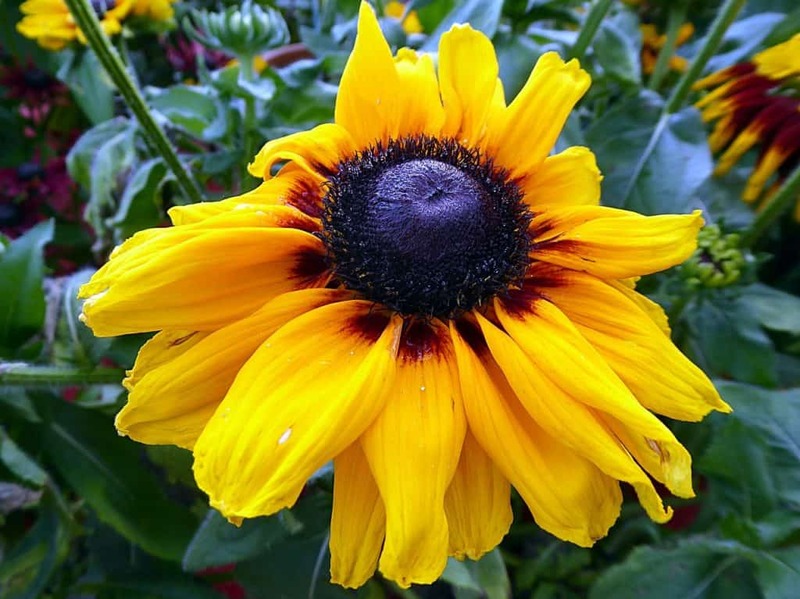 The common names black-eyed Susan and coneflower echo the contrast between Rudbeckia’s colourful, generally yellow petals and the prominent dark brown or black cone that protrudes from the centre of the flower. Rudbeckias grow in dry savannahs, grassland prairies and in the glades of rocky upland forests across North America, and black-eyed Susan has been the official flower of the US state of Maryland since 1918. The name Rudbeckia was given to the plant by Carl Linnaeus, the father of modern taxonomy who formalised the modern system of naming plants and other organisms, to honour his patron and botany teacher at Uppsala University in Sweden, Professor Olav Rudbeck. There are three other types of daisy-like flowers that are sometimes known as coneflowers (Echinacea, Dracopis, and Ratibida), but this article is about choosing, growing and caring for Rudbeckia, a bushy stalwart of the herbaceous border that produces masses of flowers from late summer right through the autumn. Suitable varieties are also available to brighten up summer bedding, wildflower gardens, prairie-style plantings and cut flower beds. Rudbeckia’s flowers are typically yellow, but some orange, red and brown varieties have been developed. Many of the perennial varieties can be bought from garden centres and nurseries as young plants raised in pots or modules, and some are also widely available as seed. There are many more varieties that can be raised from seed to be treated as half-hardy annuals or short-lived perennials, and can be obtained from garden centres and through specialist catalogues. Golden compass produces masses of classic bright yellow and black Rudbeckia flowers on a bushy plant. It grows up to 70cm in height, and can be grown from seed as a half-hardy annual or a short-lived hardy perennial. Available as packets of mixed seeds that produce a colourful display of 50cm to 60cm tall flower border plants in various shades of orange, red, mahogany and gold. Best grown as a half-hardy annual by sowing in February to April under glass for flowers the following July to September. They are good for cutting and will repeat flower. This erect half-hardy annual grows to about 60cm tall and has warm red flowers from June through to autumn. This well-named half-hardy annual or hardy perennial has very large golden yellow flowers that can be up to 18cm in diameter. It is very erect and strong-growing, up to 60cm tall, and is relatively drought-tolerant. It has an RHS Award of Garden Merit. Marmalade lives up to its name, bearing large, golden-orange flowers with very prominent cones. It is an excellent border plant, is only 40cm to 45cm tall, and makes a beautiful addition to a vase. It can be grown as either a half-hardy annual or as a short-lived hardy perennial. Another variety that can be grown as a half-hardy annual or as a short-lived hardy perennial, but this one has beautiful bright, rose-coloured flowers on tall stems up to 120cm in height. An unusual species, often known as clasping coneflower, this is an erect annual with ovate, stem-clasping leaves and 5cm to 7cm yellow flowers with a dark brown cone. This species is the classic ‘Black-eyed Susan’, with sunflower-yellow flowers and a very black central cone. It does better in damper ground than many of the varieties. This stunning plant is one of the larger varieties of Rudbeckia, with a height of 1.5m and a spread of 90cm, giving it a bush-like appearance in the height of summer and into early autumn. Its 6cm diameter flowers have warm orange petals with yellow tips. These Irish eyes will certainly make you smile. An unusual variety with a yellowish rather than brown cone as well as yellow florets. Its brilliant large, golden flowers keep coming from July through to October. Herbstsonne is a robust, tall variety that will grow up to 2m in height, with branched stems that bear single flower-heads with golden-yellow rays around a pale greenish-yellow cone. This is probably the most widely available variety of Rudbeckia. It has won more medals and awards than Sir Chris Hoy, including the RHS Award of Garden Merit! It has 12cm-diameter flowers with rich, deep-yellow, reflexed petals and a very dark central cone. It makes a superb feature in the mixed border as it grows up to it full 60cm in height, and in an open position it will make a clump about 50cm in diameter. It is fully hardy across the UK and will continue to flower until the first frosts. This is more drought-tolerant than many other varieties and is therefore suitable for drier soils. It produces shining, golden flowers with jet-black cones from early September to late October or even November. It has a height of 70cm and a spread of approximately 50cm. Although the flowers are slightly smaller than some other varieties at around 7cm diameter, they are produced abundantly and provide a complete yellow blanket across the top of the plant. It has an RHS Award of Garden Merit. Goldquelle is a popular variety because of its unusual, very showy, double yellow flowers that will add cheer to any herbaceous border. This species is often known as ‘brown-eyed Susan’, as its small flowers have reflexed yellow petals and a relatively pale brown central cone. It has been awarded an RHS Award of Garden Merit. Cherokee sunset produces fantastic semi-double flowers in shades of brown-bronze on stems up to 50cm in height. It is suitable for growing in pots or the border. For gardeners looking for something completely different, this variety has no petals but instead has showy green sepals set around a large black cone. This least yellow of all Rudbeckias flowers from August to October and grows to a height of 80cm. Rubeckias are pretty tough plants with simple requirements – a sunny, warm position in decent soil enriched with organic matter, and adequate water. They will generally survive short-term drought conditions, but flowering will suffer. The perennial varieties rarely die out from the middle of a clump as they age, and they can generally be left pretty much to their own devices. However, their rhizomes will gradually spread, and if the border becomes overcrowded or plants start to merge into one another, then Rudbeckia clumps can be lifted and divided to make space and to encourage continuing flowering. Occasional division of clumps will also invigorate them, and produce some useful extra plants. Division is best done in the spring before the annual growth begins, or in late autumn when flowering has finished. Rudbeckias are really best suited to garden borders, but some of the smaller and sturdier varieties such as R. fulgida ‘Little goldstar’ can be raised in large pots and other containers (at least 50cm diameter) as long as they have effective drainage holes. The half-hardy biennials tend to be better suited than the larger perennials to life in a pot. The plant’s preference for a well-drained but moist soil means that they need a good multipurpose potting compost and regular watering when grown in a container. Rudbeckias generally grow well in positions with full sun, though most will tolerate some light shade for at least part of the day. Some species such as R. laciniata and R. gloriosa grow more happily than others in dappled shade. Plants should be watered whenever necessary during spring, summer and autumn to keep the soil moist. Most varieties will survive short periods of drought, but optimum moisture conditions will prolong the flowering period. The foliage can be damaged or stained by watering in the sun, and wet leaves can be prone to fungal disease, so always direct the watering can or hose onto the soil, rather than over the foliage. When it comes to soil, Rudbeckias are pretty catholic in their taste and will grow in almost any type of soil that is fertile, moisture-holding and well-drained. The addition of plenty of organic matter before planting out will provide an excellent foundation, especially on clay soils. In addition to pre-planting preparation, add a 5cm layer of garden compost, well-rotted manure or another suitable organic mulch after planting and again in subsequent springs when working on the border. This will also help to retain soil moisture and control weeds. In good soils, Rudbeckias should need little or no feeding. A sprinkle of blood, fish and bone can be added at planting, and a modest annual feed of a granular general plant food in spring will help any plants that seem to be struggling to reach their potential. Do not feed with nitrogen-rich fertilisers, as this will encourage leaf growth at the expense of flowers. Plants in pots will appreciate a feed of general liquid plant fertiliser every month or so in the summer, and especially during the flowering period. Rudbeckias generally require little care or attention, other than the ritual dead-heading of faded blooms to encourage repeat flowering. For the varieties that are naturally branching, it is possible to promote a greater abundance of flowers by ‘stopping’ or tip-pruning. This is done by simply pinching out the leading shoots from the plant from just above a leaf base when it is about a third of the way to its full height in the early spring. This promotes the growth of side shoots lower down the stem, as a result of which the plant should produce even more flowers, albeit a little later in the season. Towards the end of the flowering season, many gardeners choose to keep the dying flower heads intact to produce seed for the garden birds, or to collect it for winter storage and sowing the following spring. Seed-heads left on the plant also look quite attractive through winter, and may also lead to some self-seeding of new plants in open ground in the border around the plant. All half-hardy annual varieties and many of the perennial Rudbeckias can be obtained as seed. In March or April, this should be sown thinly onto trays of moist seed compost, very lightly covered with a little additional compost, and then kept at a temperature of around 20ºC. Add about 25% washed sand to the compost, especially for raising the Rudbeckia hirta varieties. They should germinate within two to three weeks. Once a suitable size, the seedlings should be transplanted individually into 7.5cm to 10cm pots. Once the danger of frost has past, they should be hardened off for one to two weeks before planting out in May or early June. If a proportion are started and planted out early, perhaps at the risk of catching a late frost, some varieties will bloom in the first year in the garden. The perennial varieties can be increased by division of strong clumps, ideally in the spring though they can also be divided in autumn. Water the plant well the day before lifting and dividing it, and cut off all the foliage to about 15cm from the soil. Use a fork to lift the clump, doing as little damage as possible to the root-ball. The rhizome can generally be pulled apart or cut quite readily with a sharp knife, or a small saw can be used – the blade should be clean, and ideally sterilised. Discard the central, old part, and re-use the more vigorous outer parts of the clump. Replace the new plants in the garden at a 50cm spacing. The perennials can also be propagated by taking basal cuttings and putting these into a good potting compost with some grit for drainage. Rudbeckias in good growing conditions are rarely affected by pests or diseases. However, they can be prone to fungal leaf diseases, especially if they are crowded in a border and grown for prolonged periods in humid conditions. Over-feeding with a nitrogen-based fertiliser can also lead to sappy leaf growth that becomes more vulnerable to infection. Leaf spot and powdery mildew are the most commonly encountered fungal diseases. Leaf spot begins with dark spots on the leaves: these gradually spread, and the affected leaves may eventually fall off the plant. The plant only really suffers long-term damage if the outbreak is severe and it loses a large number of leaves, and it may be that the disease is just a symptom of suboptimum growing conditions that are themselves at least partially responsible for harming the growth. Moving the plant to a more open, drier position with more suitable growing conditions may be all that is necessary to prevent the condition from worsening or re-occurring. Meantime, take any spotted leaves off the plant as soon as they are noticed, and destroy them to reduce the local reservoir of spores. Powdery mildew is also a sign of unfavourably warm and humid conditions. It is diagnosed quite easily through the presence of a white powder on the leaves, and in severe cases the leaves can turn yellow and fall off the plant. Even then, it tends to be more unsightly than terminal. 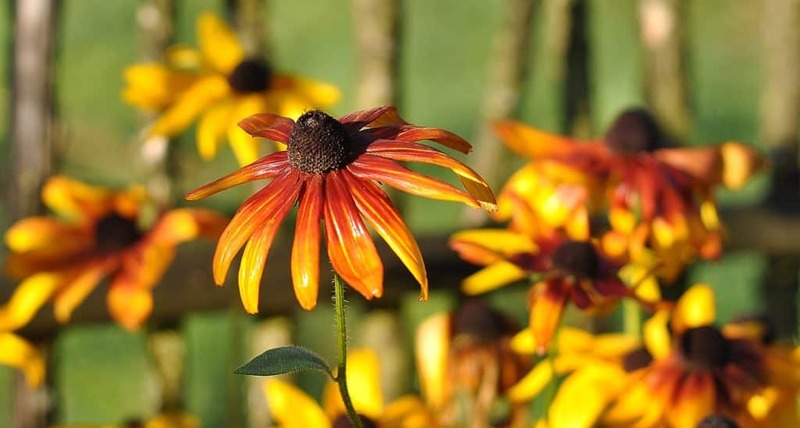 Planting Rudbeckias in a position that gets full sun and with lots of room for air circulation is generally enough to avoid any serious infections. Proprietary fungicides can be used in accordance with their instructions if required as a short-term fix, but if the conditions are fundamentally wrong for the plant, the disease will simply re-occur in the future. Q Black-eyed Susan looks great in my neighbour’s garden and I have asked for a piece next time he divides his. Will they make good flowers for the vase? Rudbeckia is very versatile and makes a great addition to flower borders, cottage gardens, containers, courtyard gardens, and certainly the cut flower garden. It is a very useful and colourful cut-flower and has a vase life up to 10 days. Seed heads can be dried and used in out-of-season, long-term arrangements. Q Can you give me some practical design tips for a making a herbaceous border? September is a good time to plant herbaceous border perennials as it will give the roots time to grow and get established before the plants begins to put on top growth in the following spring. Use bigger species like Rudbeckia individually, or in odd-numbered groups in a larger border. Plant them around 50cm apart. Blue and yellow usually combine well, and Rudbeckia especially complements summer and autumn blue and purple flowers, such as Michaelmas daisies and other Asters, scabious, rosemary, lesser calamint, and Russian sage. It can also be used as part of dazzling mass plantings of bright contrasting colours by mixing it with purple Sedums and red or bright pink Helianthemum, Helenium, Crocosmia and Osteospermum. The perennial Rudbeckias can also be used in naturalistic prairie plantings, in amongst grasses such as Stipa gigantea and Calamagrostis and other suitable plants such as Achillea, Persicaria, Echinacea and large Alliums. Prairie gardens tend to work better on a large scale in a sunny location, and designers recommend restricting the planting to approximately 25 types of plant, each planted in long, sausage-shaped groups of 10 to 20 across the garden. Designing with contrasts of height, texture and form in mind is at least as important as the consideration of colour. Q I bought a tray of black-eyed Susan plants from my local garden centre and will be planting them out in a mixed border soon. The planting instructions on the label are pretty generic, so I asked my mum, who has a lovely garden, for advice. She told me that she used to grow them, and that they were climbers that spread all over the garden and died every winter, so she stopped. That’s not what I expected – I thought they were daisies. Does she have it wrong? I think there is some confusion here. Your mum was probably growing an entirely different plant – Thunbergia alata – that is also known as black-eyed Susan. It s a very fast growing half-hardy climber that produces orange, Nasturtium-like flowers from June to September. A very different plant indeed! Q Are Rudbeckias and Echinaceas the same thing? No. They are very closely related genera from the Asteraceae family, but they are not the same thing. They produce similar daisy-like, long-stemmed flowers with a central cone, but – with the exception of some recent cultivars – Rudbeckias are generally yellow or orange flowered, and Echinaceas are generally pink, purple or almost black. The petals of the Rudbeckia flower tend to point generally outwards, while the Echinacea petals more often curve back and downwards in a reflexed manner. Q I have a lot of slugs and snails in my garden. Will they attack a Rudbeckia if I plant one? If you can find a warmer, sunny spot that does not get too damp, try one there, but make sure you buy a type with really hairy leaves and stems to provide maximum chomping resistance (one of the original species such as Rudbeckia fulgida would be a good choice). It would be worth instigating some slug baiting or control around the plant until the young, more tender leaves harden off and it begins to grow.